Fonckel One is a high design lamp, a experience with LED design lighting. This design table lamp is different than every other design lamp, because it has his patented gestured interactions. You can direct, focus and dim the led light. This is why this design light ‘Fonckel One’ is a special and exclusive lamp. 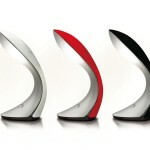 This design light is a touch lamp, you will discover that it is fun to touch! Fonckel is an innovative lighting brand that develops intuitively controlled lamps. Using the patented Lumotion® multi-touch control technology it allows people to shape light as if they can grab it directly with their hands. By means of easy and fun hand gestures on the touch sensitive casing, the light beam can be directed in a wide range of angles, dimmed, intensified, broadened and focused. Fonckel One is used as a bedlamp, desk lamp, night lamp or next to the couch. View the Fonckel One Demo Movie to find out how the light works. More info on the Fonckel company and the multi-touch control technology are available at: www.fonckel.com.